On December 5, 2015, the Russian military launched an experimental satellite reportedly to test capability for tracking enemy submarines. 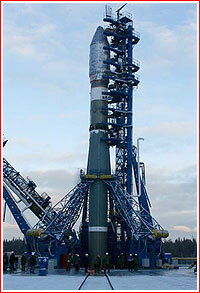 The Kanopus-ST satellite rode into orbit on the second Soyuz-2-1v rocket, following the successful inaugural launch of that booster at the end of 2013. 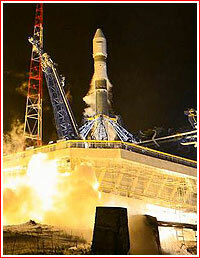 Although the launch vehicle performed as planned, the satellite failed to separate from the Volga upper stage. It reentered the Earth's atmosphere on December 8, 2015. Pace of our development depends primarily on the level of support from our readers! By the mid-1980s, experiments conducted from aircraft proved that microwave radiation can be used to study properties of water in the atmosphere and in the oceans. Such important parameters as level of salinity and temperature of the sea surface could be determined by bouncing ultra-high-frequency waves, or UHFs, from the surface of water with the help of instruments known as radiometers. (764) In theory, the penetrating properties of radio waves could also be used to bounce signals off underwater objects, such as submarines. Not surprisingly, the field attracted the attention of the military. In 1990, a group of Soviet engineers led by Grigory Chernyavsky at the nation's Academy of Sciences began researching the use of microwaves for monitoring oceans from space. The team claimed the development of the first "probing microwave scanner," MTV3A, which was launched on Dec. 10, 2001, onboard the Meteor-3M-1 satellite. The instrument was designed to measure crucial weather parameters, such as water content in the clouds, temperature and humidity in the atmosphere, radiation levels and wind speeds. 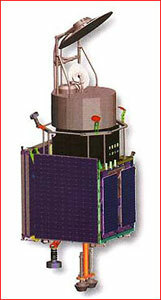 A more advanced UHF radiometer designated MTV3A-OK was developed for the Ukrainian Sich-1M satellite, which was launched on Dec. 24, 2004. 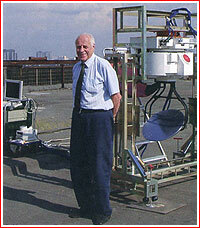 The instrument had a wider UHF range and, in addition, featured optical, ultraviolet and infrared sensors. The payload was miniaturized to 160 kilograms to fit into a low-cost micro-satellite, such as the Vulkan (volcano) platform developed at the turn of the 21st century at the Moscow-based VNIIEM institute. The same company also built Meteor and Kanopus satellites. VNIIEM planned to introduce its new satellite series with the Vulkan-Astrogon satellite carrying hyper-spectral cameras developed in cooperation with the IZMIRAN research institute. It would be followed by Vulkan-E with a high-resolution imaging payload and, finally, by Kanopus-Vulkan for multi-spectral scanning of oceans' surface. (751) A competing proposal for an ocean-watching satellite also came from PO Polyot based in the city of Omsk. 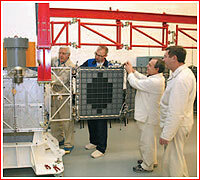 At the time, the company was also developing the Sterkh search and rescue satellite. 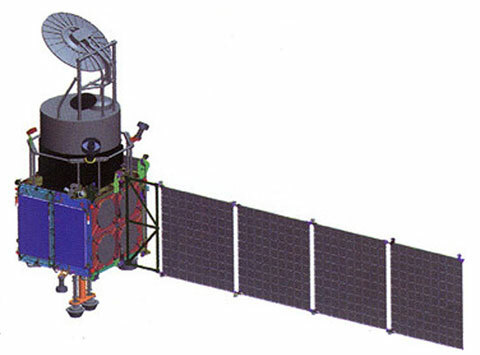 From the outset, the Kanopus-Vulkan project was identified as a "dual-purpose" satellite, implying its military role in addition to civilian space applications. It was included into the civilian Federal Space Program with a planned launch date in 2006. However the project apparently lingered with little or no funding until the military took over responsibility for it. 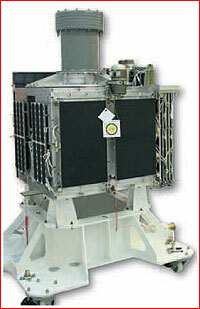 In March 2008, the Russian Ministry of Defense awarded a contract for the Kanopus-ST satellite to PO Polyot. The official goal of the project was to build a demo satellite for "hydro-meteorological research and underwater monitoring." 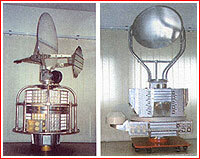 At the same time, PO Polyot delegated the development of the UHF radiometer for the satellite to Chernyavsky's company, then known as NTTs KMZ and later renamed NTTs Kosmonit. According to the company, the radiometer onboard Kanopus-ST would have a resolution from 12 to 160 kilometers and be able to scan a swath of surface 2,200 kilometers across at a time. Along with the UHV radiometer, Kanopus-ST was also expected to carry a KMVD-E camera with 100-millimeter lenses for obtaining optical images of land and ocean surface. The optical system would be able to discern details from 30 to 50 meters size and have a swath of 1,000 kilometers. 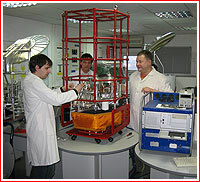 According to information released by PO Polyot in 2009, the 2.5-meter-tall Kanopus-ST would be made of a box-shaped service module measuring around 0.8 meters in size. It would be topped with the main payload and flanked by a single solar panel extending 4.4 meters in its deployed position. At the time, the spacecraft was scheduled for launch in 2011 and it was designed to operate for five years in a 830-kilometer Sun-synchronous orbit. However the project experienced a number of technical problems and design changes, leading to considerable delays and cost overruns. It required several new agreements with sub-contractors in 2010 and 2011, culminating in a protracted legal battle between PO Polyot and OAO RKS corporation, the parent company for NTTs Kosmonit. In its final configuration, the Kanopus-ST satellite could weigh as much as 441 kilograms. According to official descriptions, it was still expected to use microwaves to scan the ocean surface and cloud cover. In April 2010, to the surprise of the observers, a representative of NTTs Kosmonit Vladimir Boldyrev told the official RIA Novosti news agency that instruments on the Kanopus-ST satellite would be able to detect submerged submarines, giving the Russian Ministry of Defense a new anti-submarine system. According to Boldyrev, the satellite could still be useful for civilian remote-sensing and meteorological research in addition to its military tasks. Although the previously quoted resolution of instruments onboard Kanopus-ST seems to be too low to discern submarines or their wake, the satellite could be a precursor for more advanced high-resolution systems. The alleged anti-submarine capability apparently led to the classification of the Kanopus-ST as a military payload. Further public information on the status of the project and its instruments was largely restricted. From the outset of the project, Kanopus-ST was designed to be small enough to be launched on a light-weight rocket. 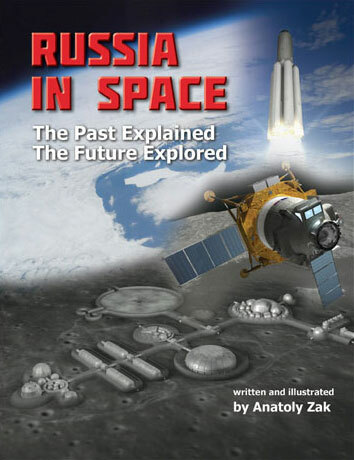 During the 2000s, launch vehicles like Kosmos-3M, Rockot and Angara-1.2 were all under consideration (751) and Kosmos-3M was reported as a primary launcher for the mission as late as 2012, even though the veteran booster had completed its final flight in 2010. 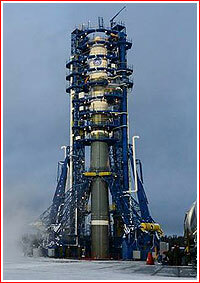 In 2013, Kanopus-ST was officially switched to the second Soyuz-2-1v rocket to fly. According to previous plans, this mission would carry the Mikhailo Lomonosov satellite, but the payload was continuously delayed. 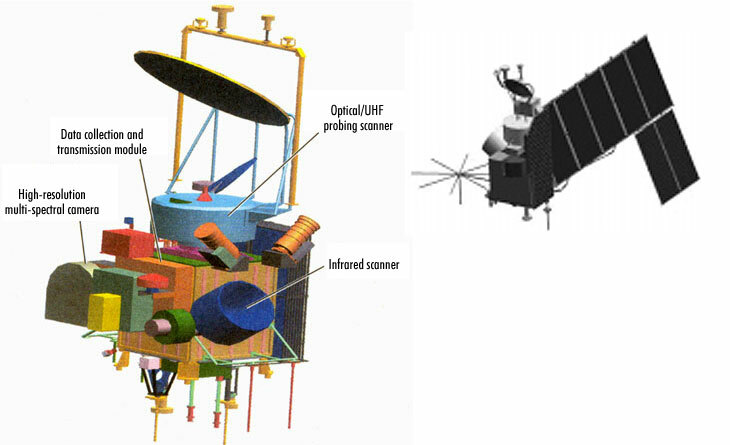 In the fall of 2010, PO Polyot in the city of Omsk reported building two prototypes of the satellite, designated 05DI and 03MS, intended for dynamic testing. However only in December 2014, did PO Polyot announce that after many technical problems, the development of the Kanopus-ST would be completed before the end of the year. At the beginning of 2015, the Interfax news agency reported that the Kanopus-ST mission could lift off in the second quarter of the year. In February, TASS quoted the head of RKTs Progress as saying that the launch could take place at the beginning of summer 2015. In July, TsSKB Progress released a document showing the launch on Sept. 4, 2015. However, the mission was reportedly under pressure, possibly due to issues with the payloads and a schedule conflict with the first satellite in the EKS constellation, which needed the same launch facility in Plesetsk. Still, the military establishment apparently considered Kanopus-ST to be important enough to press ahead with the launch before the end of 2015. On November 27, the Russian government began issuing advisories to air traffic to avoid three areas along the ascent trajectory associated with the expected launch of Kanopus-ST during the launch window from Dec. 4 to Dec. 6, 2015. On December 4, 2015, the liftoff was scheduled for 17:08 Moscow Time. However a problem with the payload during an automated launch sequence required at least a 24-hour delay. The new attempt was made on December 5, 2015, at 17:08:33 Moscow Time (9:08 a.m. EST) and, according to the Russian Ministry of Defense, the liftoff of the Soyuz-2-1v rocket was performed successfully. The assets of the Titov Chief Test Space Center began tracking the ascent at 17:11 Moscow Time, the official TASS news agency reported. 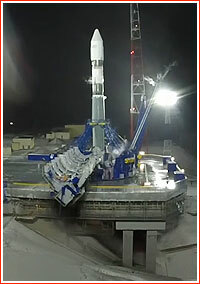 The official video showed the 160-ton, 45-meter rocket leaving the snow-covered launch pad in winter darkness. 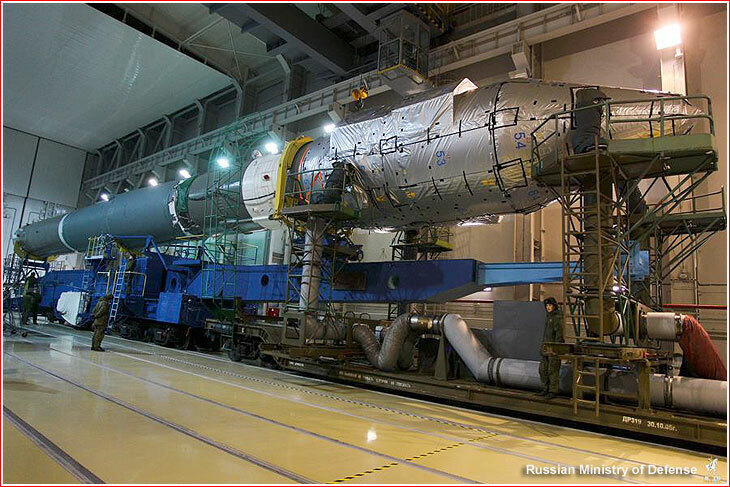 The Volga upper stage and two military spacecraft separated as scheduled from the second stage of the launch vehicle, the press service of the Ministry of Defense was quoted as saying. The report indicated that the orbital insertion would continue for two hours before the separation of payloads from the Volga upper stage. At 19:14 Moscow Time, the RIA Novosti news agency posted a report quoting press-service of the Ministry of Defense as saying that the Volga upper stage had delivered two military satellites into orbit. 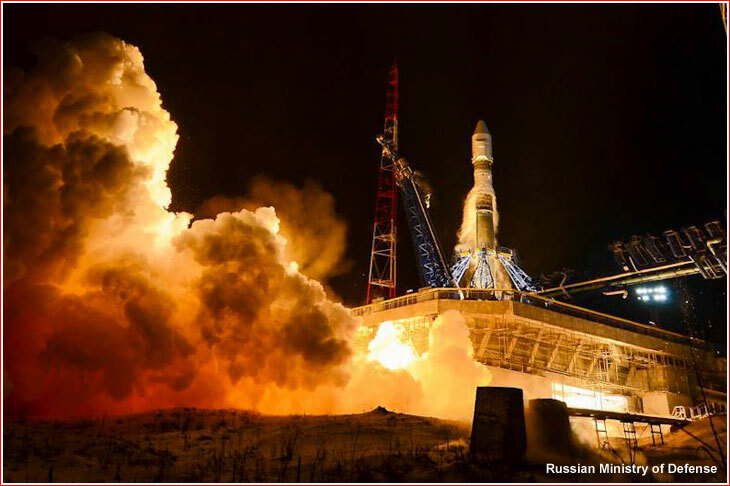 By 20:00 Moscow Time, the Ministry of Defense announced that onboard systems of the satellites identified as Kosmos-2511 and Kosmos-2512 had been functioning well and (one of) the spacecraft was maintaining reliable telemetry communications with ground control. The satellites had entered their planned orbit as scheduled and had been under control of the Titov Chief Test Space Center, according to the Ministry of Defense. 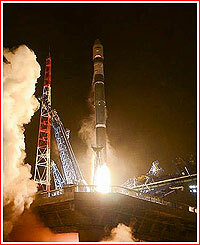 The second Soyuz-2-1v rocket lifted off from Pad 4 at Site 43 in Plesetsk, heading almost exactly north, under the power of a single NK-33 main engine and the four thrusters of the RD-0110 steering engine. 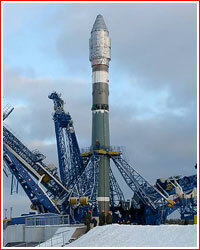 Lacking the four strap-on boosters of its predecessors in the Soyuz family of rockets, Soyuz-2-1v relied solely on a modified core booster as its first stage. At the end of the first-stage burn, around two minutes into the flight, the RD-0124 engine of the Block I booster, serving as the second stage, fired through a lattice structure connecting two boosters. The first stage then separated, followed by the tail section of the second stage moments later. The ring-shaped tail section then immediately split into three segments. 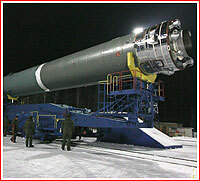 Both the first stage and the fragments of the tail section were to splash down in the Barents Sea, north of Murmansk. As ascent continued, the payload fairing split in two halves and its fragments were to fell into the Arctic Ocean, south of the Spitsbergen Archipelago. The second stage continued powered flight sending its passengers to the very top of the world, between the northern coast of Greenland and the North Pole. The second stage was expected to deliver the Volga upper stage and its payload into a 220 by 709-kilometer orbit parking with an inclination 98.17 degrees toward the Equator, where Volga and the second stage would separate. Upon reaching the apogee (highest point) of the initial orbit, the Volga was expected re-start its engine to enter the Sun-synchronous polar orbit at an altitude of 701.5 kilometers. 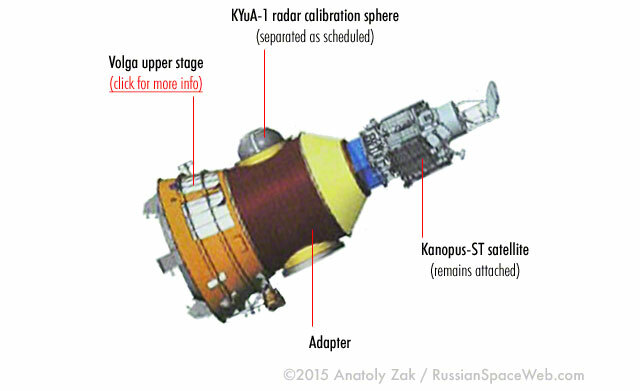 Along with the Kanopus-ST satellite, the rocket carried the KYuA-1 radar calibration sphere, which was to be used for radar tests by the Almaz-Antey company, the developer of anti-aircraft and anti-missile systems. 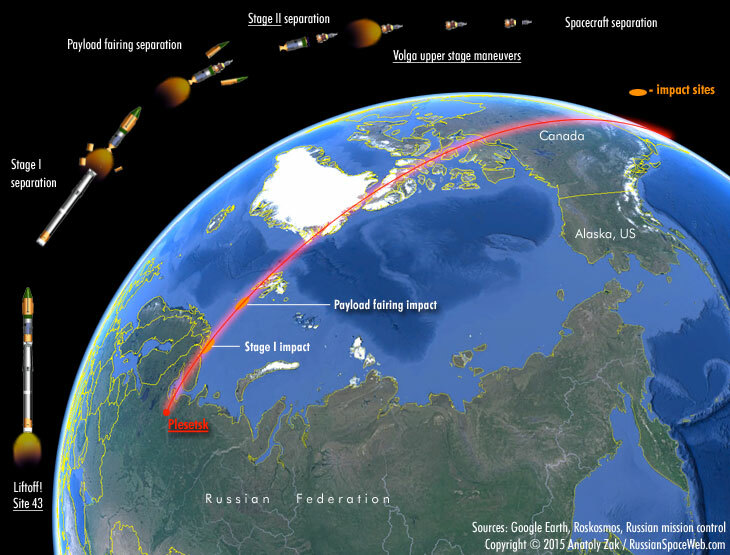 Around 10 hours after the release of the satellite, the Volga upper stage was expected to conduct a deorbiting burn, followed by the reentry into the Earth's atmosphere over the western section of the Pacific Ocean, where the Russian government claimed a huge no-fly zone during the mission's launch window. Within 24 hours after the launch of the Kanopus-ST satellite, Russian media reported that one of the spaceceraft had failed to separate from the upper stage. The first report about the problem was issued by RIA Novosti at 13:18 Moscow Time on December 6. On December 7, the official TASS news agency quoted an unnamed source at the Russian Air and Space Forces, VKS, as saying that the inter-agency commission at the Plesetsk launch site had declared the Kanopus-ST satellite a loss. Ground control attempted to establish contact with the spacecraft in an effort to issue backup commands for its separation from the upper stage but without success, the VKS source said. According to preliminary information, one of four locks attaching the satellite to the stage failed to open during the separation process, TASS reported. Like the rest of the satellite, pyrotechnic locks were assembled at PO Polyot company in the city of Omsk. According to industry sources, available data from the mission indicated that the separation system between Kanopus-ST and the Volga upper stage had been powered up and activated, however the spacecraft had still failed to separate, possibly, due to a mechanical problem with the lock. In the meantime, USSTRATCOM tracking information indicated that on December 6, around 04:50 Moscow Time (8:50 p.m. EST on December 5), the Volga upper stage (with Kanopus-ST still attached) had maneuvered to a 104 by 564-kilometer orbit. The lower portion of this elliptical path would take the satellite into a much denser upper atmosphere, causing very quick decay of the orbit and a fiery demise of the spacecraft. The maneuver could've been programmed into the flight assignment of the Volga upper stage before launch in order to reduce space junk after the delivery of the satellite. According to a veteran space historian Jonathan McDowell, extra mass of the attached spacecraft prevented the immediate deorbiting of the stage, leaving the stack to circle the Earth for a few days. 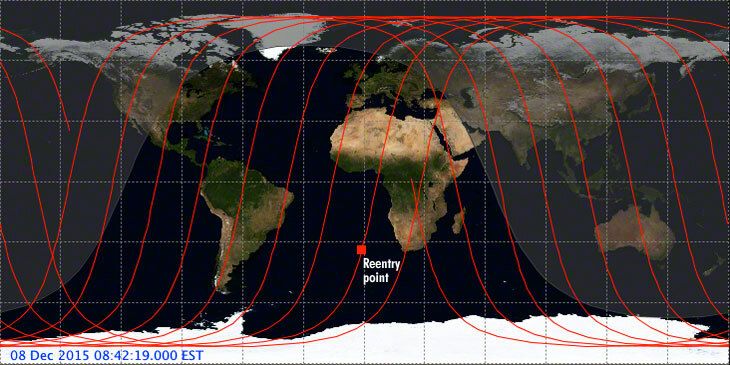 According to USSTRATCOM estimates, the reentry could take place in the early hours of December 8, likely near the perigee of the satellite's orbit located over the Southern Hemisphere. Several hours before the expected decay, another object associated with the mission was listed by USSTRATCOM under a designation 2015-071D 41102. It was expected to reenter within two or three hours after its neighbor. Ground observers reported that they had tracked two objects in the predicted path of Kosmos-2511 (Object 071A) as early as 17:11 GMT on December 7. By that time, a steady bright object followed a much fainter flashing one (indicating tumbling in space) with an interval of 12 seconds. According to McDowell, the new object could be the satellite itself or its fragment, which got split from the rest of the vehicle under aerodynamic loads in the lower part of its 90 by 326-kilometer orbit. 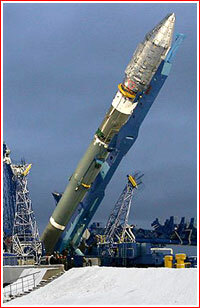 A commentator for the Novosti Kosmonavtiki Igor Lisov reported on the magazin's web forum that the stricken spacecraft made up to 15 passes through the atmosphere at an altitude of less than 105 kilometers, during which it likely encounted enough loads to tear the satellite apart from its upper stage. 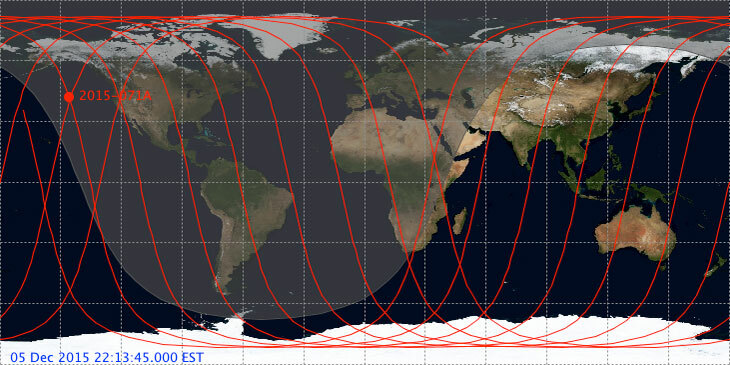 According to USSTRATCOM, Kosmos-2511 reentered atmosphere on December 8, 2015, at 05:43 GMT (12:43 a.m. EST, 08:43 Moscow Time) at 35 degrees South latitude, 1 degree West longitude. The reentry point was located over the Atlantic Ocean, off the coast of South Africa. The reentry time for the splinter object (071D) was not immediately known, but it likely fell to Earth even earlier than the primary object. Even before the ill-fated Kanopus-ST satellite plunged into the Earth atmosphere, an inter-agency commission had been formed to investigate the mishap. In traditional finger-pointing that follows launch accidents, a member of the investigation at the Russian space agency, which oversees the nation's space industry, apparently tried to shift the blame from the manufacturer to the military tracking personnel for not mitigating the problem in time. According to that account quoted in the Izvestiya daily, the ground control team of the Air and Space Forces, VKS, failed to identify the problem during the separation of the satellite from the Volga upper stage. Controllers had apparently received telemetry confirming the separation command and the correct orbital parameters of the stage and thus reported the success of the mission, disregarding the fact that the satellite had remained attached to the stage. Had they detect the problem in time, additional commands for the separation of the satellite could be sent before the Volga upper stage had maneuvered for reentry (around 10 hours after launch), the source claimed. However according to other industry sources, the Volga upper stage lacks radio-command system that could allow sending remote-control commands from the ground. The orbital insertion process is pre-programmed and has to rely entirely on built-in algorithms to deal with emergencies, sources said. Still, the alleged delay in realizing the problem might explain multiple official statements from the Ministry of Defense shortly after the launch about the success of the mission. 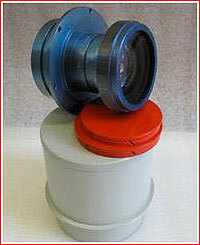 Lenses designated Russar-Meteo-100/8 PAN for the KMVD-E camera on the Kanopus-ST satellite.